Japanese for "small," this tag is used to describe super deformed characters, whose proportions are smaller for a cute effect. The following tags are aliased to this tag: super_deformed (learn more). 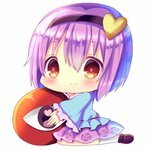 The following tags implicate this tag: shana-tan, chibi_inset, chibi_on_head (learn more).